"Do aliens exist?" This might be the most popular question you get while doing outreach! You can help your questioning audiences explore the possibilities of life in the universe with this exploration of the Drake Equation. 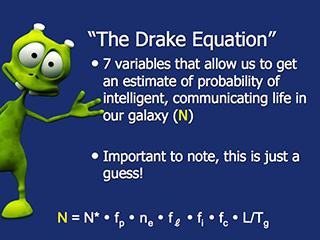 This presentation of the Drake Equation reviews each of the factors that contribute to the likelihood of intelligent life in our galaxy. The presentation can easily be made into a fun interactive outreach activity, with participants discussing 6 questions in groups. Starting with all of the stars in the Milky Way, the presenter methodically looks at many variables that together estimate the potential number of intelligent civilizations in the galaxy. Bonus! See how we can analyze exoplanet atmospheres using spectroscopy with the slides at the end of this presentation.